A legacy from America’s “Secret War” on Laos. Many bombs were dropped on this country during the Vietnam War, although war was never officially declared on Laos. Laos was bombed when the Americans were chasing the fleeing communist North Vietnamese soldiers who were hiding in Laos, as well as randomly aerial bombing the Laos-Vietnam border to destroy the so-called “Ho Chi Minh Trail”. The Ho Chi Minh Trail was a large logistical network used by North Vietnam to transport people, food and equipment through the dense forests of Vietnam and Laos. The Americans cluster-bombed the “trail”, which was virtually invisible from the air. Many innocent Laotians were killed as a result. 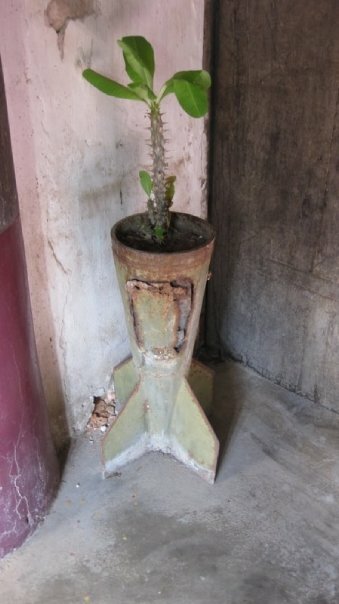 10% of the cluster bombs did not explode and became virtual land-mines. Since then, thousands of Laotians have been maimed/killed by unexploded bombs that were dropped by American bomber planes a few decades ago. Even today, Laos remains the most bombed country in the world. Who’s to pay for all this? America? Certainly not. It’s good to be a “super power”, no?